Remarks: Beautiful rambler with vaulted ceilings, meticulously maintained, located within walking distance to nearby parks! Large lot and great neighborhood! See agent remarks. Buyer agrees that at any time prior to Third Party Approval as defined in Section 2 above, Seller may: (a) continue to market the Property to other interested buyers; (b) continue to advertise the Property through the MLS showing any MLS status category (the MLS will allow) deemed necessary and appropriate by the Seller and/or the Third Parties; (c) accept additional backup offers for the purchase of the Property (“Backup Contracts”) subject to the rights of Buyer under this contract; and (d) Seller may or may not submit any such Backup Contracts to the Third Parties for review. Beware! 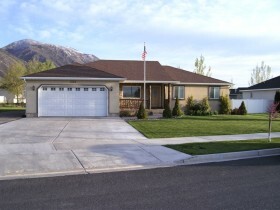 Payson Utah Short Sales Can be Tricky! Seller and Buyer acknowledge that there will be significant time delays in obtaining any response from the Third Parties to the terms of this proposed Short Sale; and because this is a Short Sale, Seller will need to obtain the highest and best terms for the sale of the Property. During this significant time delay, circumstances may change for both Seller and Buyer. The changes in circumstances may include, but are not limited to: (a) adjustments in available mortgage financing rates and terms; (b) modifications in the financial circumstances of Seller or Buyer; (c) the timing of the transaction may no longer meet Buyer or Seller’s needs; (d) Buyer may find another property that better suits Buyer’s needs; and (e) Seller may receive additional offers for the purchase of the Property that better address Seller’s legal and financial needs. Based on the above, if at any time prior to Third Party Approval, or the Third Party Approval Deadline, whichever occurs first, the Buyer or Seller determines that their circumstances have changed and it is no longer in their best interest to pursue the sale/purchase of the Property, either Buyer or Seller may cancel the REPC by providing written notice to the other party. In such instance, the Earnest Money Deposit, if any, shall be returned to the Buyer without the requirement of further written authorization from Seller. Buyer and Seller acknowledge and agree that this mutual right of cancellation is fair and reasonable to both parties.